I have an autoimmune disease called Hashimoto’s thyroiditis, which manifests itself with symptoms of fatigue, cold intolerance, hair falling out, dry skin, modest weight gain, decreased concentration and ridged, brittle fingernails. It’s not just hypothyroidism — simple bloodwork shows if you have specific elevated antibodies to confirm the autoimmune disease diagnosis. I manage the condition with Synthroid, a synthetic hormone that replaces TSH, or thyroid-stimulating hormone. I should have known something was amiss from my slow but steady weight gain over the past 6 months or so — which became so bothersome that I joined a gym down the street from my office. One visit to the endocrinologist, considered a specialist? That’s a $40 co-pay. A new prescription to increase the dosage? $25. Getting bloodwork and going back 6 weeks later to check whether it’s the correct dose of Synthroid? Another $40. I’m also having another issue that necessitates me seeing a specialist 3-4 a month. It’s nothing life-threatening, but it’s something that does require treatment. So each of those trips is $40. Not to mention some medication that is costing about $130/month. 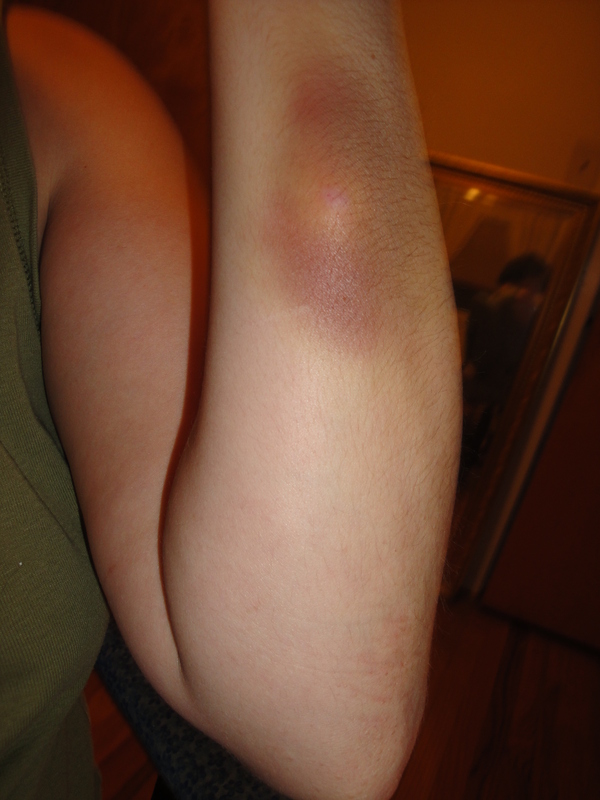 More recently, on Sunday, a family member pointed out a huge bruise on my forearm. It’s about 3.5 inches long and is marked in the center with a raised, white bump. I can move this lump around underneath my skin, which is extremely gross. There’s minimal soreness. The area is only slightly swollen, and I’m not running a fever. It’s possible I hurt myself while we were doing some more drywall installation on Saturday afternoon, but I would like to think I’d remember hitting my arm so hard that it left this monstrous bruise on me. If it gets worse in the next day or two, I’ll have to see a doctor. And now, the icing on the cake: A few weeks ago, Mr. Saver started complaining of vague pain in his knees. He’s an IT tech, so his job requires him to kneel and bend to fix hardware, and carry around computer parts. What you should understand is that he never complains about anything. In the 5 1/2 years we’ve been together, he’s not gone to the doctor ONCE. They’re stiff when he gets up and down from a sitting, kneeling or crouching position, and the pain and discomfort has been progressively getting worse. So he’ll be going to our primary care provider today (that’s $20, if you’re keeping track) to determine what the next step is. I’m confident he’ll be referred to a specialist (for another $40 co-pay). EDIT: I forgot to mention the dental cleaning and checkup that is way overdue (should be fully covered by our dental insurance) and the eye exam/contacts and new eyeglass lenses I’ll need. Wow. So even though we have insurance, our co-pays and prescriptions cost a pretty penny, especially in a month where there are multiple doctors visits and scripts to fill. For this coverage, Mr. Saver has $110 deducted from his paycheck bi-monthly. It could be much, much worse — and it is, for a lot of people. A Short Informal Poll — Answer in the Comments Section! 1. Do you have health insurance? 2. If so, do you pay for the entire premium, or is it subsidized by your employer? 3. What is your co-pay? Does it vary? Gene: Sorry for the delayed reply, I’ve been on maternity leave for a few months! My bruise did heal with no issues, and the bump went away. I did not see a doctor. I hope your son’s healed up! Have you checked around for synthroid prices? I saw it on Walmart’s list of $4 drugs, and Ralphs and Vons probably include that on their list of lower priced meds, if you’re against going to Walmart. I found that walmart prices are oftentimes cheaper than the co-pay. As for insurance, I have it through my employer but still pay $90 a month for me and another $310 for my husband. My company doesn’t subsidize spouse or family. My co-pays went down recently to $15/dr visits but it was $30/visit. Prescriptions are generally $15 but varies depending on the medication. @oilandgarlic: I haven’t checked in a while — it has to be real Synthroid, and not generic, but I’ll do some research. Thanks for the heads-up! We have health insurance (thank goodness!) through hubby’s job (federal government). Off the top of my head, I don’t remember the percentage we pay….but it is roughly $400 a month. In addition, we have a medically needy child, and we have a FSA (this year we ONLY put $3750 in….in the past, it has been $5000 and we used every penny). Co-pays….$20 for regular visits, $30 for specialist, and 25% for prescription. As a side note….my twins were very premature. And their medical bill for both for the first 5 months was 1.5 MILLION dollars. Then my son racked up another 100k in the next month, and lots since. We are still paying our portion of his bill…..we are down to the last $1200!! And they are almost 8!! I’m so glad that you’re almost done with the medical debt. It is incredible to see how much medical care can cost, especially for preemies. I have health insurance that is partially subsidized by my employer. It’s an HMO with $30 office visit copay (which tripled last year). Generic prescriptions have a $10 copay and preferred nongeneric have $25 copay. It sure does add up fast! @Bucksome: You’re absolutely right — co-pays can add up quickly. Those small amounts get larger and larger. I don’t even want to add up what we’ve spent in co-pays/medical costs so far this year. Youch, I would get that checked out, due to the abililty to move around the white bump. My husband and I have health insurance through where I work, and our copays vary also. It’s $50 for a specialist, $25 for a regular doctor, $35 for prescriptions, etc. @Jackie: I’m going to the doctor in the morning — my friends and family have sufficiently scared me into going. Wait, I scared myself by self-diagnosing on the Internet, too! I miss my BCBS PPO, boy, let me tell you. That was the worst part about my layoff. My husband works for a nonprofit that isn’t doing very well (it’s local, not national). They have cut back a lot on his plan though they pick up the tab still at about 80% I believe. We do not have a vision plan and we just lost our dentist because they switched dental plans for the third time in the past 16 months. Yet, I realize we’re lucky to even have dental. Typically the NJ companies I’ve worked for cover about 65%. We pay $20 for our general doctor, but $40 for specialists on this BCBS Direct Access plan. Ironically I rarely see my GP. I’m all about the foot doctor, skin doctor, GI doc, etc. Bummer, right? @Ally: That’s been my problem, too — all specialists, all the time. Ouch! That looks like it hurts. I consider myself very lucky as my insurance coverage is very comprehensive and I am relatively healthy *knocks on wood*. I pay $90 monthly for medical coverage+basic eye care coverage($24/copays – for either PCP or specialists), $16/mo for dental and $17/mo for prescription coverage for a total of $123/mo. My employers pays a total of $440/mo. In addition, the company pays for a super-duper comprehensive executive physical (all-in-one exam at a spa-like drs office where they give you all the exams you can think of in one sitting) for all its employees. For people in my age bracket this event is offered every 2 years. I am not on any re-occuring meds and visit for wellness exams at least 1yr. This is why I am not using the HSA account offered. I also do not have any dependents so my premium will be higher when I do. However, my eye coverage is a sore subject. I have very poor vision which requires specialty contact lenses and special lenses to avoid the coke-bottle look. Because these are “cosmetic” most insurance cos won’t cover. So..I have to pay $450 for my contact lenses (down from $700 3 years ago) once a year. Not so bad considering I wear them all year but enough that it stings. @Patti: It sounds like you’ve got great coverage (other than the speciality contacts). About 10 years ago, a pair of contact lenses for astigmatism cost an arm and leg, too (I want to say $300), but now they’re much, much cheaper (and disposable). Hopefully, your cost will come down in a few years, too. I do have health insurance, and I am lucky enough that my company pays for it completely with nothing coming out of my paycheck. I have something called a HSA Health Savings Account. My employer puts my deductible $1,500.00 into an account for each employer. All my scripts and doctor visits get deducted from that account until it is depleted. Once it is finished, I go to a normal health plan where my copay is $20 for a doctor and $30 for a specialist. Scripts can range from $5 to $20. Once the second $1,500.00 is gone all my doctors appts and prescriptions are free, but lets hope it doesn’t get that far! @Stephanie: My company used to pay for 100% of our healthcare — if we didn’t have a spouse or a dependent on it. So for years, Mr. Saver and I had two separate health insurers (he had about $100 deducted once a month from his paycheck; mine was $0). This year, they changed it so I would be paying a bit more than if we were both on his, so I switched. Before this year, I wouldn’t have used money in an HSA account. While it’s tax-free going in, it’s a use-it-or-lose-it situation every year.